The following guest blog post was written by our friend, Jin, who writes about gift ideas for professionals working in the hospitality industry. Showing your appreciation to a colleague for a job well done is a crucial part of a good business relationship. Hospitality industry professionals work and live all over the world, which makes it that much more important to connect with your colleagues and show them they are appreciated. Promotional gifts are also a great way to boost your business— everyone remembers the bottle of wine or personalized hotel card holder they received as an additional thanks for their services or yours. 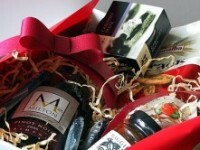 Think of business gifts, branded or not, as unique and memorable business cards. Who doesn’t like a plentiful muffin, fruit, chocolate or wine basket filled to the brim with tasty delights? This is a great option for food-loving colleagues or those brokers always on the go. Just choose the right basket to suit their tastes. If you go through an online company, like ordering an FTD fruit basket, you can choose what you want and when you want it delivered if you know you colleague or client’s schedule. A hot air balloon ride or movie tickets are a great way to show appreciation. It’s also something you know they’ll use. Websites such as Red Letter Days and Virgin Experiences allow you to buy the gift of an “experience.” It can be an art class, wine tasting course or a bungee jump— the range of experiences is huge and there will be something to challenge or entertain anyone. While women may be pleased with a wine and chocolate basket or a spa certificate, your male colleagues can be a bit trickier. ManCrates is a web-based store that delivers man-friendly wooden crates. When wrenched open with a crowbar, contain a variety of gifts that any man would love to receive. From meat, beer, computer games to sports — gone are the days of the ugly tie as the token male gift. Professionals in this business can travel a lot. Next time you are in a different city or country, find a local treasure that your colleagues would love. Local trinkets, souvenirs and food items are usually affordable, but will be new and exotic to clients and associates. Jin Cheung loves nothing more than to travel and read. Although Jin was accepted into an Ivy League school, he opted to follow his heart and pursue a career as a freelance travel writer.